Suspended Flooring Insulation - Covering shallow joists? 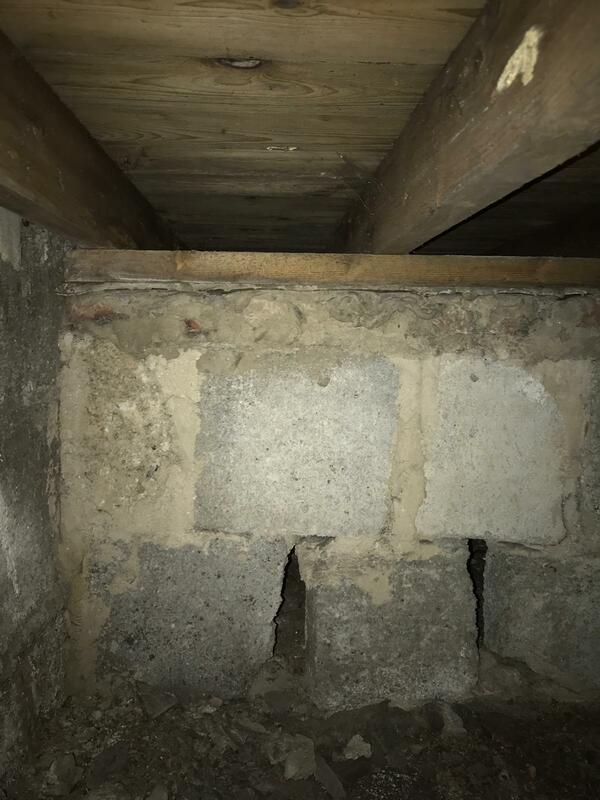 Housing - Renovation: Suspended Flooring Insulation - Covering shallow joists? Renovating an old 1940/50 Bungalow. Currently looking at insulating the suspended flooring. Floorboards are currently tongue and groove, so would rather not take them up. However it seems in each room there are 'loose' boards which can lift up to allow access to crawlspace. Crawlspace itself is quite deep - about 1m, and for that, EPS Beads doesn't seem to be an option. The crawlspace floor appears to be sealed concrete/cement floor, not dirt or the like. And 'appears' to be very dry. There are air bricks, though each rooms crawlspace seems confined to the room itself, partitioned off from others with brick etc, not sure if that is a thing - unsure how air can flow under if it is a single entry point at the 1 air brick per rooms crawlspace. The floor joists are quite short, height wise, only 90mm - so the question is, if using the insulation roll/netting method - is it fine to completely cover the joist itself with the insulation... if using 200mm insulation roll for example, then there would be approx 110mm below the level of the bottom of the joist - much like insulation in an attic - though upside down. Would this be fine - and in regards to vapor control etc, in this situation, what would you all suggest? Posted By: costley111 Crawlspace itself is quite deep - about 1m, and for that, EPS Beads doesn't seem to be an option. You mean on cost grounds? There are air bricks, though each rooms crawlspace seems confined to the room itself, partitioned off from others with brick etc, not sure if that is a thing - unsure how air can flow under if it is a single entry point at the 1 air brick per rooms crawlspace. 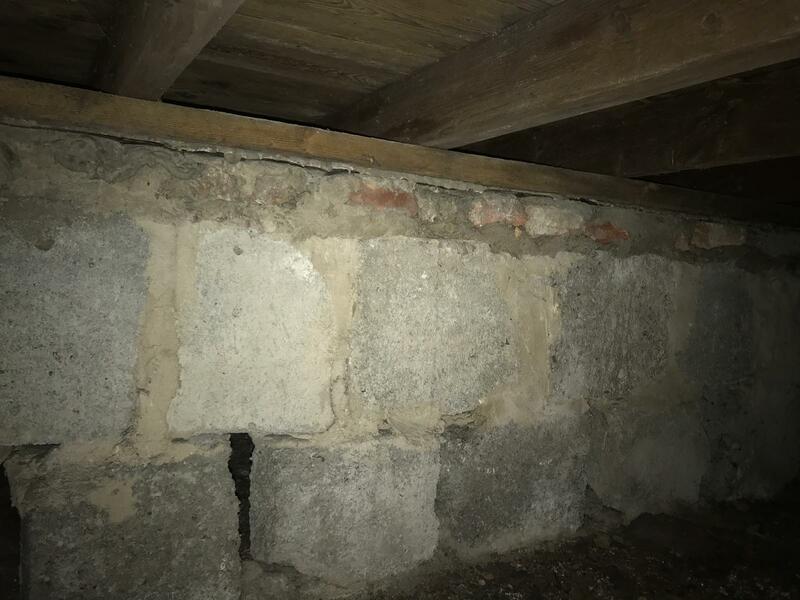 Do the joists rest on the brick? Are the walls above supported on the brick walls underfloor? 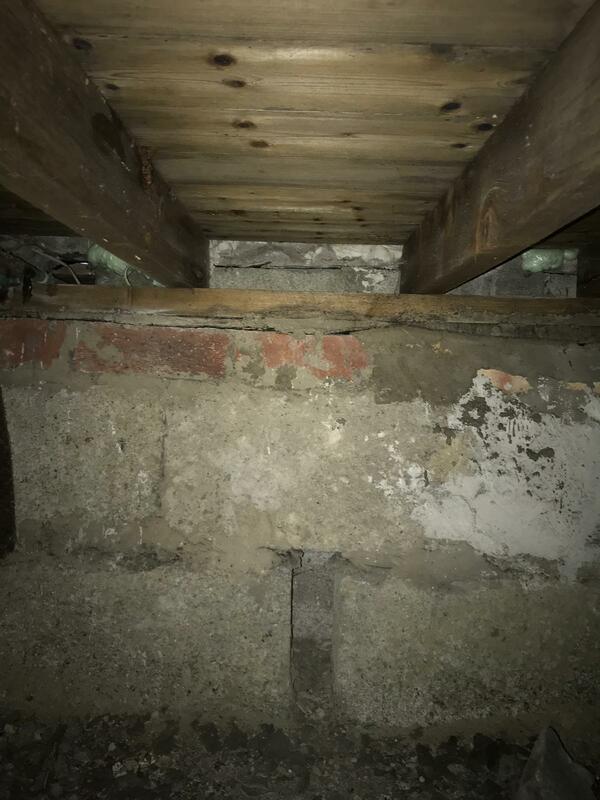 Is everything sealed or are there gaps between the brickwork and joists and if so, how big? The floor joists are quite short, height wise, only 9cm - so the question is, if using the insulation roll/netting method - is it fine to completely cover the joist itself with the insulation... if using 200mm insulation roll for example, then there would be approx 110mm below the level of the bottom of the joist - much like insulation in an attic - though upside down. Those joists are not very deep. Does the floor feel solid? Regardless, it will be fine to completely enclose the joists in insulation and for exactly the same reason as for ceiling joists - it keeps them warmer than they were. in regards to vapor control etc, in this situation, what would you all suggest? I would definitely use vapour-open insulation such as rockwool and given you don't want to lift the floorboards, I'm tempted to suggest no vapour barrier. You do want an airtightness barrier though, so a membrane of some kind somewhere - perhaps underneath the insulation? Possibly you could consider a liquid vapour barrier sprayed on the underside of the floorboards? Try putting temerature and humidty sensors in the void to see what the conditions are. It might be cheaper, easier and better to insulate just the periphery walls, if you can get enough access, to make a conditioned crawlspace. Vapour barrier on warn side of the insulation, can double as air barrier too. Without having to lift the floorboards where is the best placement on the warm side of insulation? - Directly under both the floorboards and following under all the joists? - On top of floorboards? The joists rest on the brick yes. And for the walls also yes. There are gaps, can't recall right now how big, but this could be filled with rockwool, and expanding foam where neccesary? Floor feels solid alright. That's good to hear, per your next point, I may go 100mm rockwool between joists, and 100mm again crossed over. We're getting carpet in 3x of the rooms, whereas another 3 will be laminate. Would an airtight barrier above the floorboards but beneath underlay be wise? And not a vapour barrier? I'm using breathable roofing membrane on the outside face of the insulation. I was worried about wind washing and condensation, so a vapour barrier scared me - but I am not an expert on this. 1 - Above the sleeper wall, where there is the air gap - Am I to leave this free from insulation, if so, how much of a gap up to this do you recommend? or would this render insulation pointless as its a major thermal bridge point? Or is it okay to tuck rock wool into? 2 - Where the joists meet the wall & rest on brick - same question, is it okay or not to have rock wool in this small gap? Cheers tony. I’ll do just that regarding the sleeper. Just measuring out the joist widths now. You’re saying for the perimeter leave a gap? Of how much? And would it be fine to just use expanding foam to seal around the underside of floorboards for airtightness? I'm curious what the advantage of EPS is against rockwool? Posted By: costley111 And would it be fine to just use expanding foam to seal around the underside of floorboards for airtightness? Expanding foam is not usually a good choice for airtightness, unless it is one of the special products intended for that purpose, because over time it can pull away from surfaces. Better to use a membrane or special purpose paint. - no vapour barrier (let any moisture from the house travel through as it has always done, and it will clear due to the underfloor ventilation, as it was designed to do, not trapping more moisture inside the house. Plus you won't make it vapour tight anyway, just causing local pockets of high moisture buildup). - vapour permeable membrane (what we use to wrap timber frame house walls with), get the cheapest one available, as it's not going to see any precipitation, hopefully. - fix the membrane to the top of the first joist (at the floor boards), letting it hang down. Staples are good to get it started and straight, but follow up with some felt nails ideally to make it really secure. - fill the first layer of wool into the joist gap, and the second layer against the membrane, so it sags down below the joists. - fix the membrane all the way along the second joist, making sure the insulation is hanging nicely, sort of bulging a bit so that the successive rows of sagging insulation will be touching. - keep repeating that process. - must maintain free air flow via the wall vent bricks. I didn't see these on you photos, but if they could be come covered by the insulation hanging below the joists, then you need to add telescopic extenders (plastic ducts to drop the air flow down a bit lower). - around the external wall edges, the first joist may not start tight against the wall. Use some slips of rigid insulation board up this gap first. Bit of squirty foam to hold in place. - take photos of any pipes that will get covered, so you can locate them in the future, maybe spray mark the walls or solum too, so your photo captures the markers. - 110mm drains will probably drop through the floor?? do your bet around these with membrane and wool, then squirt a good ring of foam around, in the depth of the wool, and it will bodge the whole lot together nicely. Best wishes, Donald J Trump.